Christian life coaching helps you to bring about the change you long to see, and design your life around what matters most so that you can live life as God intended. A Christian coach approaches coaching from a Biblical perspective, and helps you to bring about change God's way. Know who you are in Christ and live as though it's true. Demolish mindsets that once held you back. Are empowered and equipped to be and do all that God intended when He created you. Are living life true to your values. Know your life purpose and are living life true to yourself. Get things done, see things through to completion, and succeed where you've failed in the past. Sometimes it's difficult to see God's plan for your life by yourself. That's where a life coach comes in. If you're just getting started, read the coaching articles, use the free coaching tools and begin to apply the coaching strategies you find there. It will give you a taste of the power of life coaching to transform your life. Explore the free resources and get started with coaching yourself today. Einstein said that the definition of crazy was to do the same things in the same way you've always done them and expect different results. If you want a different outcome you need to do some things differently. If you're stuck yet longing to move on and ready to do what it takes, life coaching will help you to overcome the obstacles, shorten the learning curve, and follow through with focused action. Left to your own devices this is where you're likely to get stuck. Most people either spend too much time thinking and planning or take too many unfocused actions. Christian life coaching helps you to focus on God's plan for your life and live life God's way. If you want to make changes but find yourself struggling to get beyond the first steps, coaching will get you unstuck and help you to get the breakthrough you've been hoping for. Christian life coaching videos to inspire you and encourage your heart. The thought of initiating major life change can be overwhelming. Where do you find the information you need? How do you keep yourself motivated and on track? When you subscribe to my free newsletter The 5 Minute Life Coach - I'll send you a step by step guide - Be Your own Life Coach Now - as a way of introducing you to the power of Christian Life Coaching. Your new life can start now! I promise to use it only to send you The 5 Minute Life Coach. Be sure to add this page to your favourites - I'll be adding new resources and you'll need to check back to make sure you don't miss anything! If you sense God calling you to train as a life coach check out our Christian Life Coach Training. All the resources are online so you can easily train with me wherever you live in the world. Our training is inspiring, practical, and it equips you to coach yourself and other people to breakthrough. The added bonus of our training is that YOUR life gets transformed in the process. I'd like to offer you a FREE Life Coaching Guide so that you can start transforming you life TODAY! Simply enter you first name and email address so I can send you my inspiring coaching guide. You'll find tools to help you start making changes straight away. An occasional dose of inspiration & encouragement to help you on your journey. Because I want to give you the opportunity to experience the power of coaching for yourself. There's no catch. The resources are completely free and without obligation. God is a speaking God; He has never stopped speaking to His people. 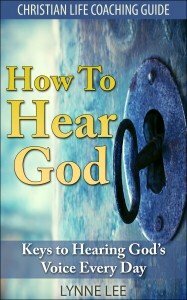 God is always speaking, and He wants YOU to be able hear Him. God is a loving Father whose deepest desire is to have a two-way conversational relationship with the apple of His eye, His beloved creation. It thrills me to know that we have an invitation from God Himself into the sacred privilege of a close, intimate relationship with Him. There is a link to free resources in the book. They are worth way more than the price of the book. I trust that you will be richly blessed. A coach improves your performance your competitiveness and productivity by identifying the skills and talents you have then supporting you to develop the confidence to use those whilst opening your thinking to realise others which are available. Lynne has the discernment and insight to recognise innate ability; and possesses the confidence and the skills to work with you to realise your full potential. She is among the best I have worked with.